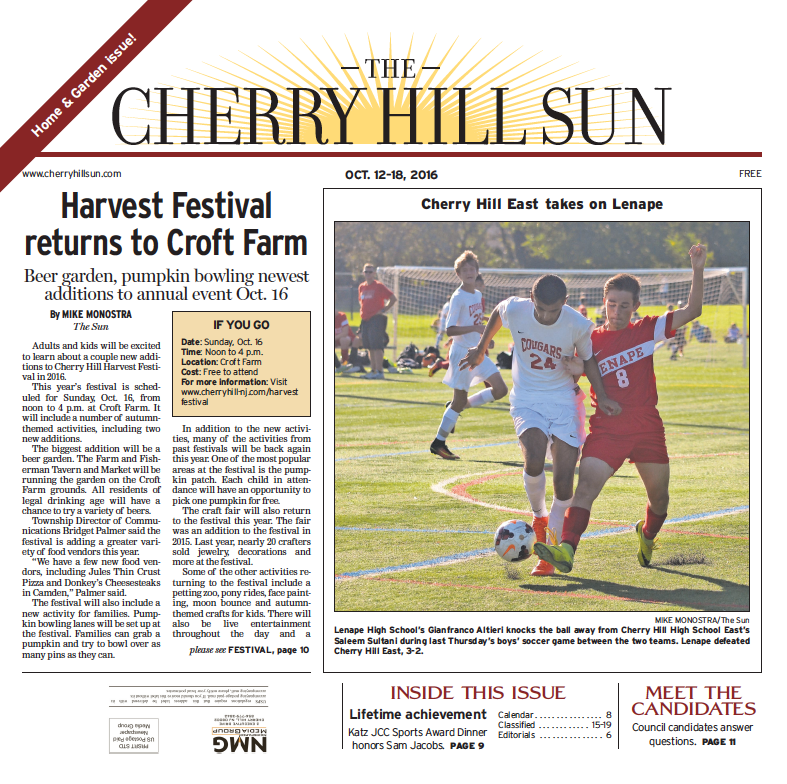 With the final issue of the year set to come out next Wednesday, take a look back at some of the stories and photos featured on the front page of the Cherry Hill Sun in 2016. 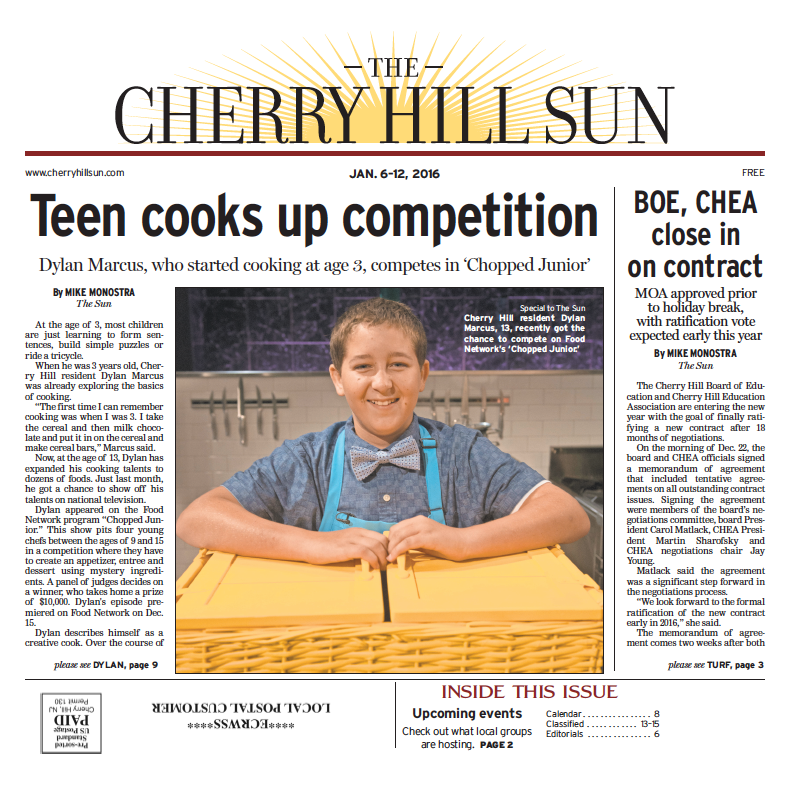 The year 2016 was filled with plenty of news in Cherry Hill. From articles on extraordinary residents in town to news on government and schools, there was no shortage of stories taking place in the township this year. 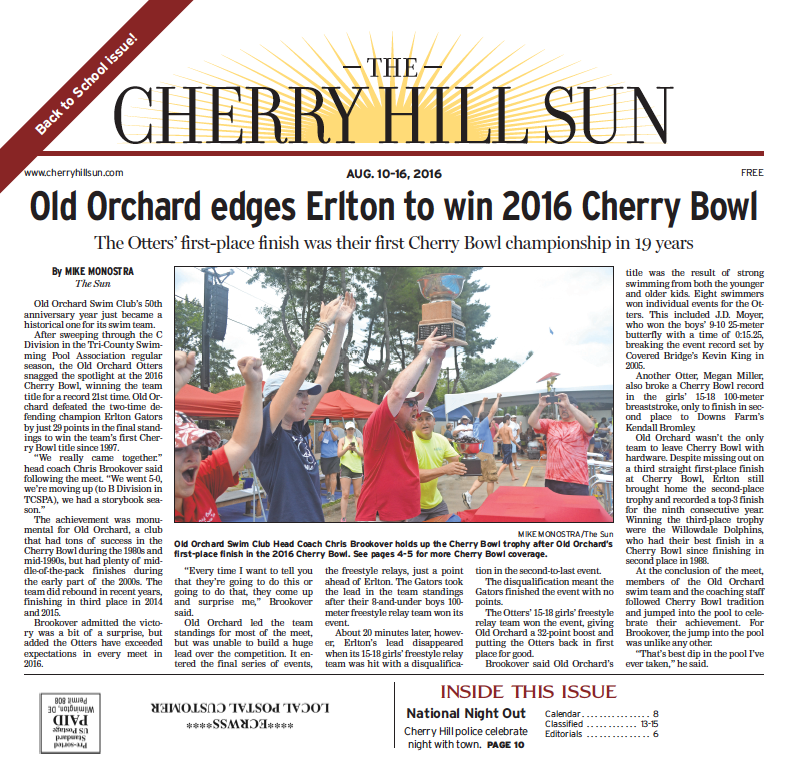 Hundreds of articles appeared in the Cherry Hill Sun over the course of 2016. However, only some stories and photos were able to make it to the front page. Check out how the Cherry Hill Sun’s front pages looked in 2016 below. 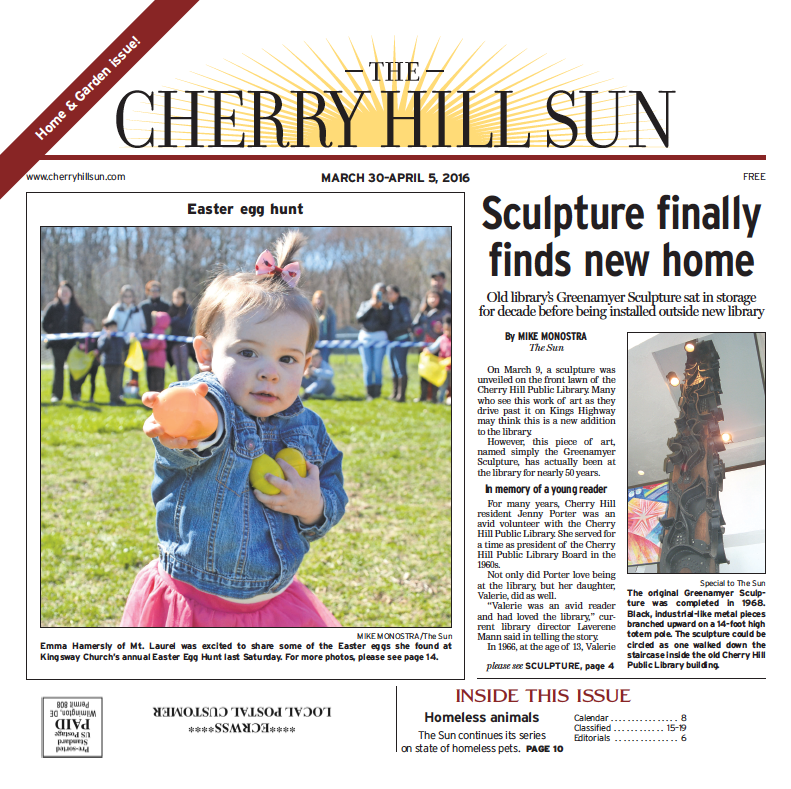 Barclay Farmstead’s 200th anniversary kickoff and a feature on the Cherry Hill Public Library’s Greenamyer Sculpture were two front page stories featured early in 2016 in The Sun. Government news — 13 stories: There was a ton of government news in the township in 2016. 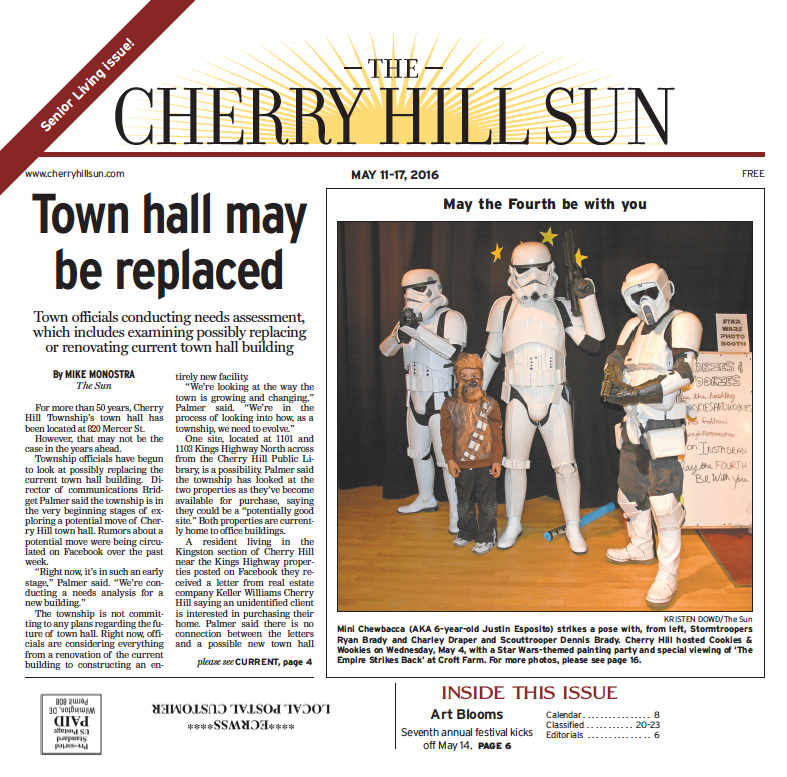 Talk of Cherry Hill Town Hall moving to Kingston was featured twice on the front page, once in May and a second time in June. 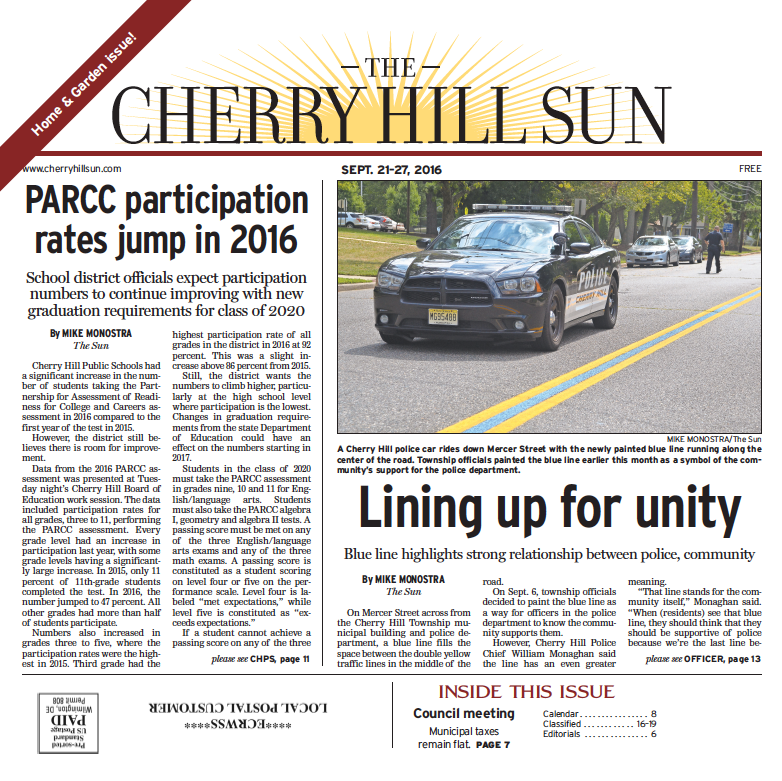 Cherry Hill Township Council’s adoption of the B4 zoning ordinance amendment was another widely talked about front page government story. Resident profiles — 13 stories: Dozens of residents were featured in The Sun this year for their extraordinary accomplishments in life. 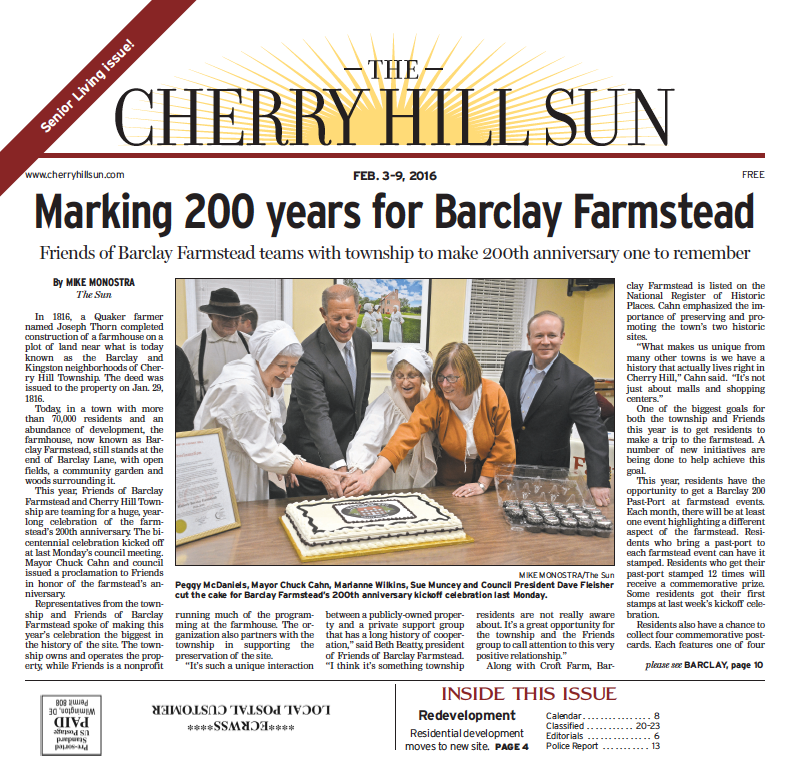 Some people featured on the front page included Sydney Breslow, a 24-year-old who has overcome the challenges of mitochondrial disease and plans to begin a career as a special education teacher; and Bonnie Cocchiaraley, long-time Cherry Hill resident who was honored in the spring for her role in preserving Barclay Farmstead. School news — 12 stories: The ratification of the contract between the Cherry Hill Board of Education and Cherry Hill Education Association was front page news early in the year. Other big stories were the release of 2016 PARCC scores and news on the 2016–17 school budget. 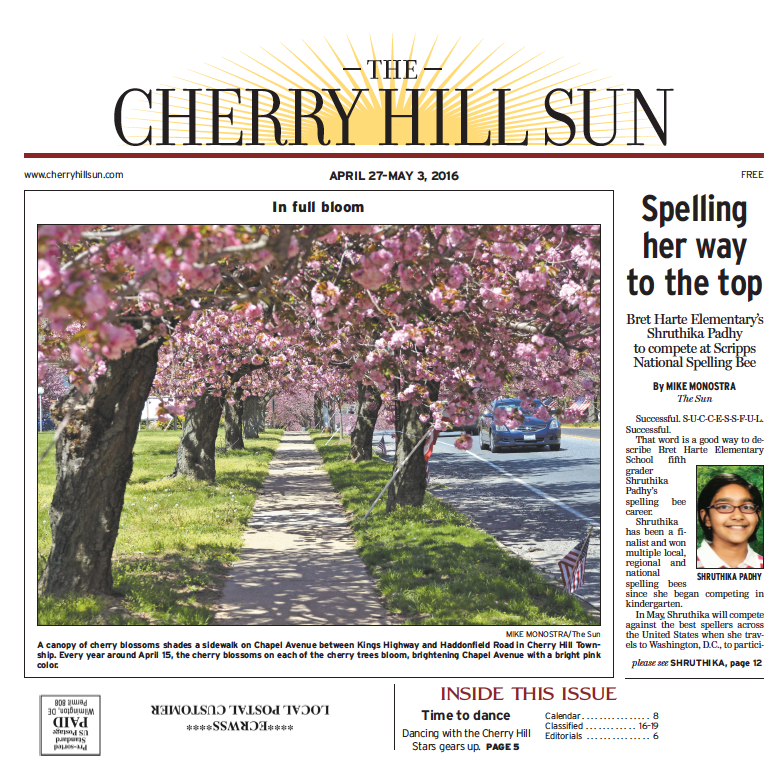 Front pages from the Cherry Hill Sun in April, May and June. Features — 12 stories: There were 12 articles featuring organizations, places and objects found around Cherry Hill Township. The reconstruction of the Greenamyer Sculpture in March and a profile of Cherry Hill-based nonprofit Carz N’ Toyz were some of the front page feature stories from 2016. Arts and entertainment — six stories: The Cherry Hill Sun featured a total of four musicals and on the front page of 2016. The features included previews two Disney musicals in the spring (“Beauty and the Beast” at Cherry Hill High School East and “The Little Mermaid” at Cherry Hill High School West) and a musical featuring visiting students from Ponce, Puerto Rico. 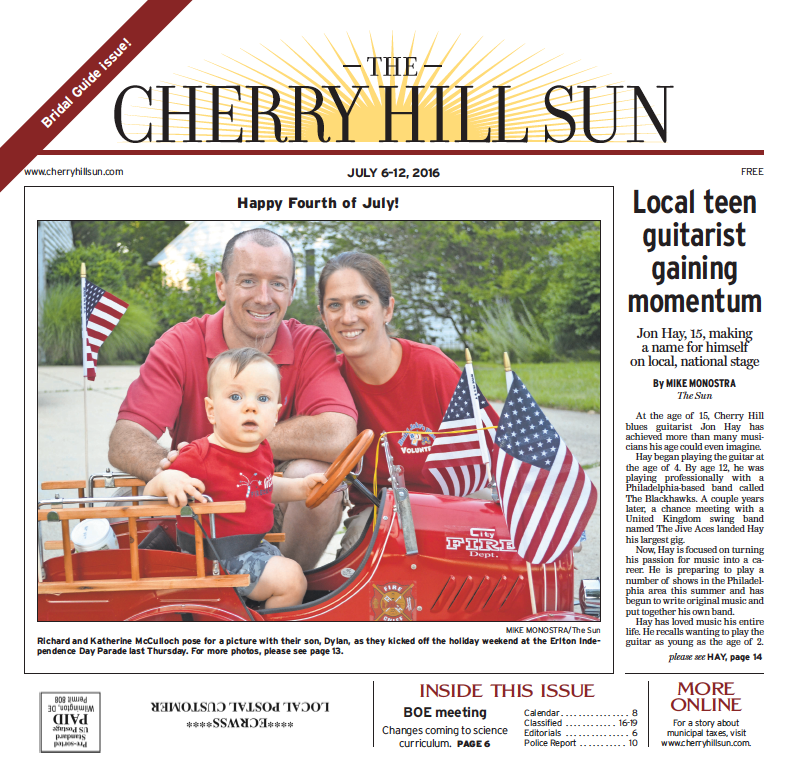 Front pages from The Cherry Hill Sun in July, August and September. Sports — 11 photos: There were numerous Cherry Hill East and West sporting events photographed during the 2016 calendar. Other sporting events, such as Cherry Bowl and summer Cal Ripken Baseball Tournament action, were also featured. Town events — eight photos: Numerous events around Cherry Hill Township were photographed throughout the year. Events included township-sponsored events such as Earth Festival and the Holiday Lighting Ceremony, as well as neighborhood events such as the Erlton Independence Day Parade. 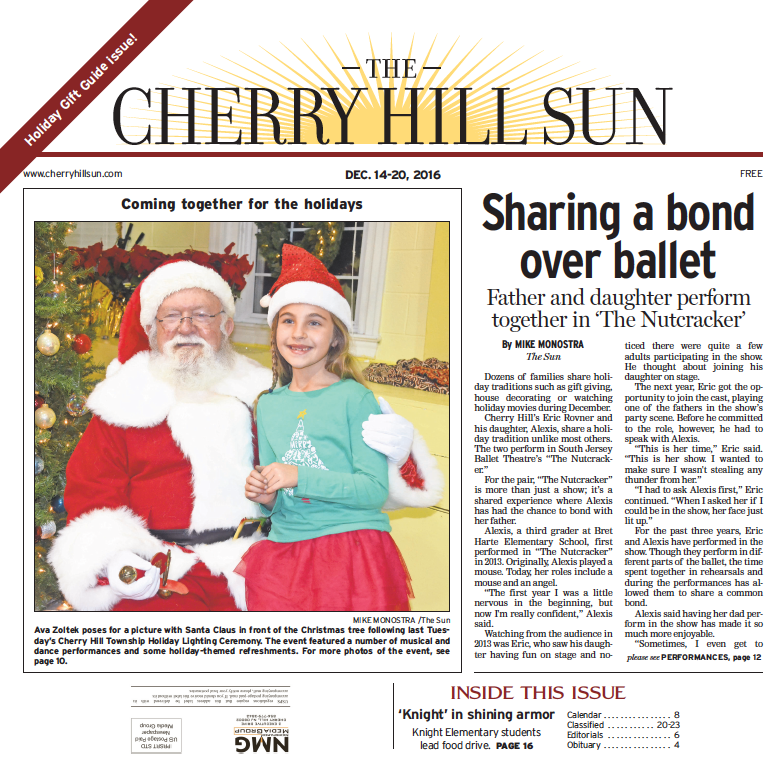 Front pages from The Cherry Hill Sun in October, November and December. Photos around town — seven photos: There were also a few weeks where photos from around town were featured on the front page. Sun photographers took a number of photos at local parks and the Cherry Hill Public Library, catching a glimpse of everyday life from around town. School events — six photos: Sports and musicals weren’t the only school events on the front page this year. The Sun also featured everything from Volley for Support to an after school dinosaur-themed party on the cover. 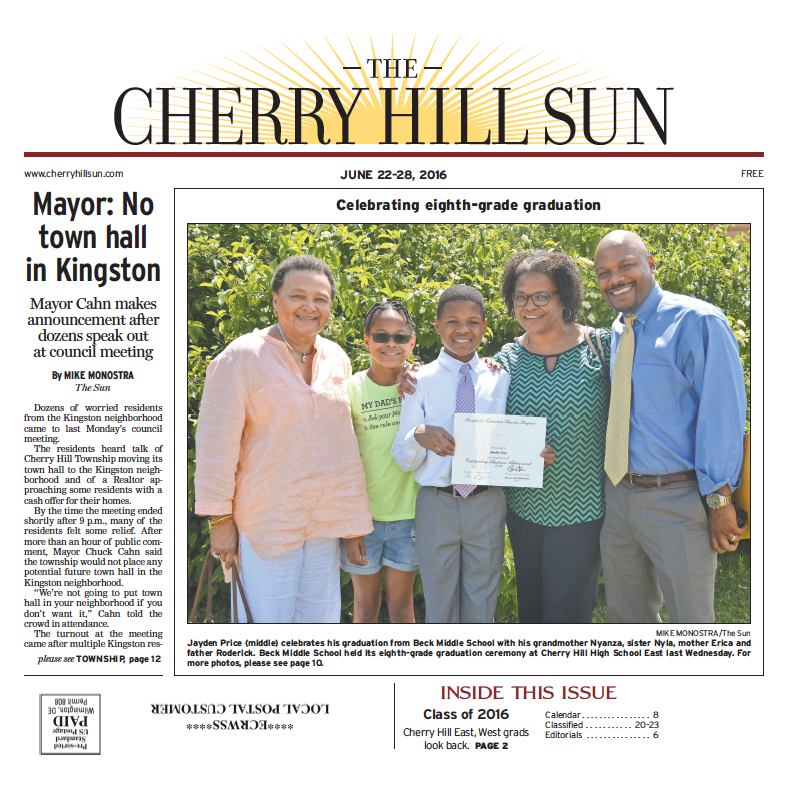 Feature story — five photos: From the kickoff of the Barclay Farmstead 200th anniversary celebration to a feature story on Cherry Hill-based nonprofit Distributing Dignity, The Sun had images of a few feature stories to show off on the front page.